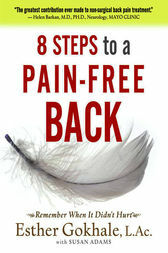 With a fresh approach to a common problem, this self-help guide to overcoming back pain advocates adopting the natural, healthy posture of athletes, young children, and people from traditional societies the world over. Arguing that most of what our culture has taught us about posture is misguided—even unhealthy—and exploring the current epidemic of back pain, many of the commonly cited reasons for the degeneration of spinal discs and the stress on muscles that leads to back pain are examined and debunked. The historical and anthropological roots of poor posture in Western cultures are studied as is the absence of back pain complaints in the cultures of Africa, Asia, South America, and rural Europe. Eight detailed chapters provide illustrated step-by-step instructions for making simple, powerful changes to seated, standing, and sleeping positions. No special equipment or exercise is required, and effects are often immediate. Esther Gokhale, LAc, is the founder of the Esther Gokhale Wellness Center, a licensed acupuncturist, and the creator of the Gokhale Method™, a revolutionary approach that helps people achieve better health through better structure. Susan Adams is a writer and editor specializing in biotechnology and computer technology.